Human Milk Oligosaccharide (HMO), one of the most abundant solid components in breast milk, supports the development of a strong immune system. Abbott is the first company in the world and in Vietnam to successfully fortify this nutrient into an infant formula – Similac Eye-Q with HMO. Let’s visit Abbott’s research and development centre and manufacturing facility in Singapore to understand how the scientists bring this breakthrough innovation to life! Many years ago, scientists already knew the role of HMO – a special prebiotic previously present only in breastmilk – in developing babies’ immunity. The question that concerned scientists and researchers around the world was how to add it into infant formula to improve immunity for babies who couldn’t be breastfed. After nearly two decades of research with over 20 clinical and pre-clinical studies, Abbott’s scientists were among the first who discovered the method to fortify HMO, bringing the formula closer to the gold standard of mother’s milk. This innovation helps to narrow the gap in immune system development between breastfed and formula-fed babies. With more than 600 talented scientists, engineers and doctors from all over the world working in collaboration with a global network of R&D centres, Abbott and Similac have always been at the forefront of pediatric nutrition science, constantly innovating to provide the best possible start for babies. Seventy per cent of a baby’s immune system resides in the gut. HMOs feed the good bacteria in a baby’s gut that are crucial to building strong immunity. At the same time, they help reduce the prevalence of harmful bacteria. But even more special is that HMOs are absorbed into the bloodstream to support the immune system beyond the gut. Studies have shown this nutrient helps boost the immune system, significantly reducing infections. Being able to include this important nutrient in formula is one of the biggest advances in infant nutrition in the last decade. Globally, Similac is the first formula on the market with 2'-FL HMO. In June, Abbott gave good news to Vietnamese mothers and babies when it officially launched Similac HMO in the country. The new Similac Eye-Q meant that, for the first time, parents could have confidence their baby is getting the nourishment they need to support a healthy immune system, even if they are not able to breastfeed. It took Abbott’s scientists over 15 years of thorough and dedicated research to bring this innovative formula to life. Part of the journey took place at the Abbott Nutrition Asia-Pacific Research and Development Centre (ANRD) in Singapore. The centre was established in May 2010, becoming the largest nutrition R&D facility outside of the US and the first in Asia. Today, this facility employs more than 60 talented scientists and support staff from 10 countries in the region who are focused on creating science-based nutritional products for people in every stage of life. Dr. Yen Ling also shared that, with more than 20 clinical and pre-clinical studies over 15 years, scientists at Abbott are always making the greatest effort to optimise the Similac formula for baby development. The breakthrough innovation of Similac Eye-Q with Natural Vitamin E, Lutein and HMO is a demonstration of Abbott’s pioneering spirit and commitment to nutritional science. In addition to infant formulas, Abbott's experienced scientists lead research and clinical trials on both pediatric and adult subjects in areas such as food and sensory science, novel ingredient evaluation and clinical nutrition science. Abbott scientists in Singapore tailor new ingredients, products, flavors and packaging to the tastes and preferences of people throughout Asia. Every nutrition product, including Similac, is the fruit of the scientists’ passion, sacrifice and love for the customers, especially the children. Abbott has a long history of bringing together key leaders in nutritional science to discuss emerging issues and opportunities. The interaction between global thought leaders and Abbott’s nutrition scientists is a catalyst for innovation in areas important to our future. 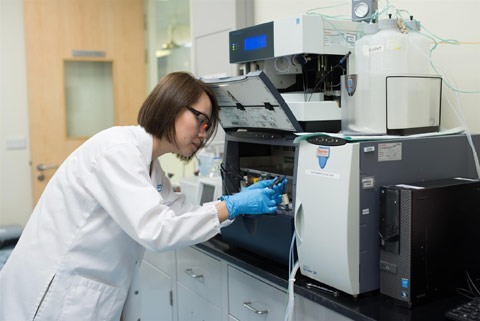 Abbott's R&D network connects the research centre in Singapore with four other research centres, six technology centres and three different prestigious science universities including Harvard Medical School and Johns Hopkins University to develop innovative research on a global scale. With the mission of creating science-based nutritional products for people at every stage of life, the global R&D teams keep innovating to develop products that allow Abbott to help people live healthier, fuller lives. Similac Eye-Q with HMO is a bright demonstration of this commitment, giving babies the opportunity to develop immune systems and build solid foundations to grow and thrive. Just as parents always want the best for their children, Abbott scientists are motivated by the desire to use the latest science to help consumers live healthier lives.